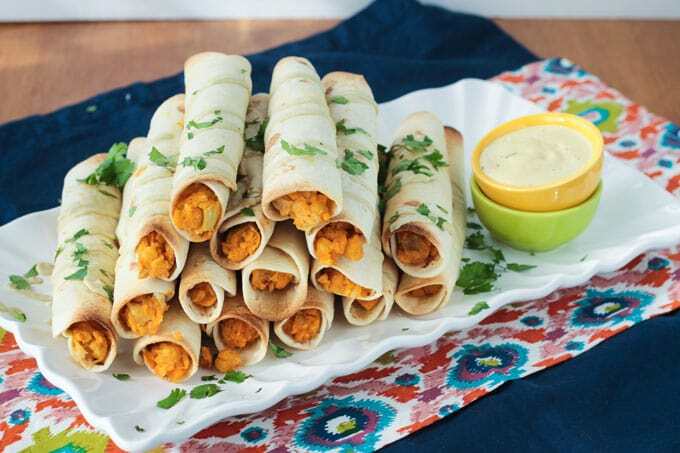 Buffalo Chickpea & Artichoke Baked Vegan Taquitos – a delicious, creamy, spicy snack for game day, parties, or anytime. Easy to make them as spicy (or not) as you want them. They make a great lunch or dinner too! These spicy buffalo vegan taquitos are meant to be an appetizer or snack, but let’s be honest, I could make a meal out of these! The filling is a creamy mixture of smashed chickpeas, chopped artichokes and my now famous “cheesy” Butternut Mac sauce (a reader favorite!) all mixed with Buffalo style hot sauce. Easy to make as spicy hot (or not) as you like. Judging from the popularity of my Buffalo Cauliflower Bites, I’d say you guys love buffalo sauce! Let’s get the (vegan) party started!! These taquitos are super easy to make, especially if you use staple ingredients like canned chickpeas and frozen artichoke hearts. You can even buy pre chopped butternut squash for the “cheese” sauce. 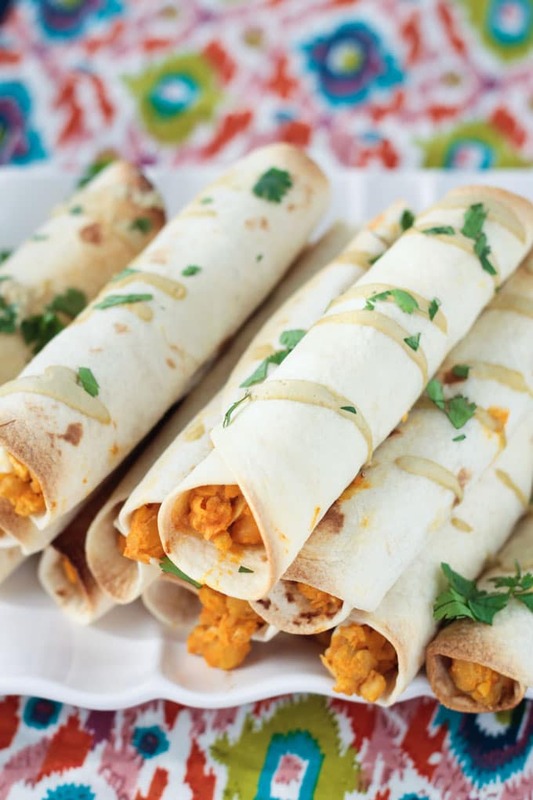 While this is definitely not a traditional taquitos recipe, it is absolutely delicious! I served them up with my Creamy Cumin Ranch, which was the perfect accompaniment. You could also dunk them in Guacamole, an incredibly easy dip that should be on your party table anyway. And if you’re feeling extra cheesy, try them with my Homemade Vegan Queso. Taquitos, or rolled tacos or flautas as they are sometimes called, traditionally use corn tortillas and are fried until crisp. I used flour tortillas here because I find they hold together better, but you can use whatever you like best. Using corn tortillas would make these completely gluten free. And my vegan taquitos are baked, not fried, using no oil! If you like a lot of spicy heat, add more buffalo style hot sauce, if you like things on the tamer side, use a little less. 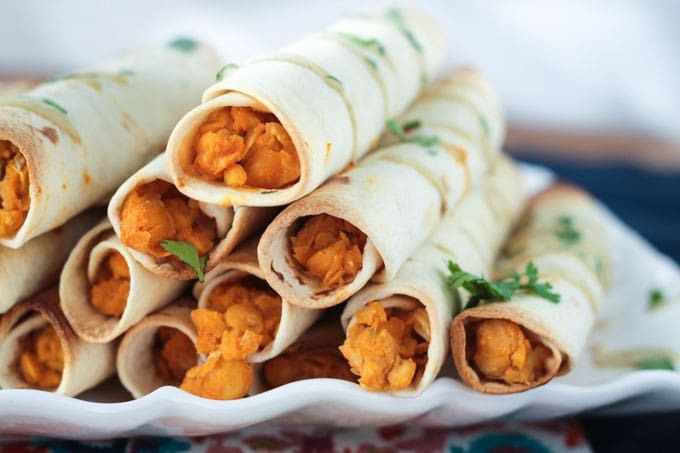 If you try these Baked Vegan Taquitos please leave me a comment below with your feedback and rating. I love hearing from you guys! You can also find me on social media. Be sure to tag @veggie_inspired and #veggieinspired so I’m sure to see your post. I can’t wait for you guys to try these! 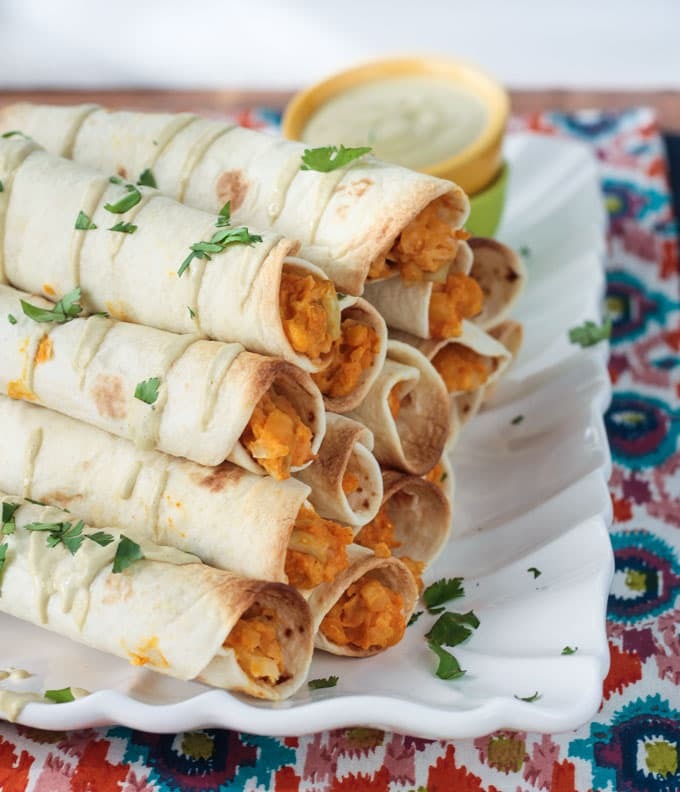 Buffalo Chickpea and Artichoke Taquitos are perfect party food - especially great for game days! 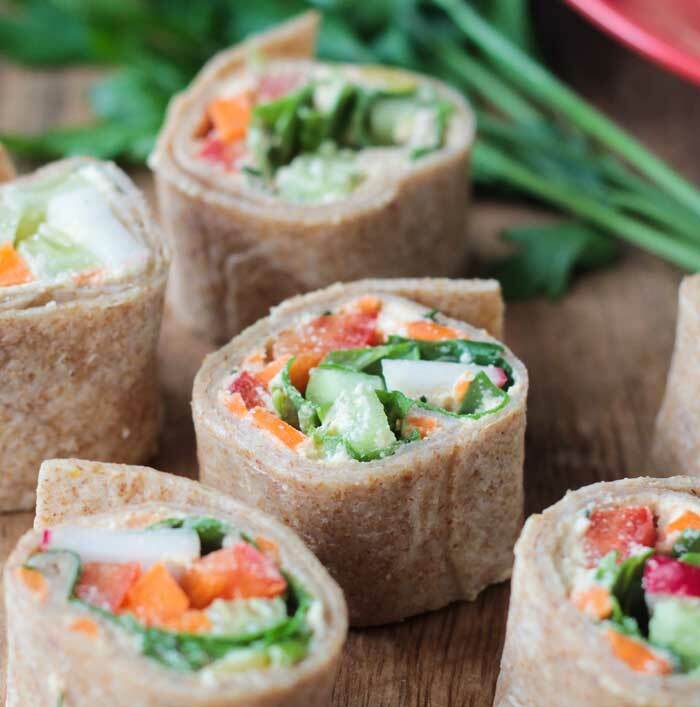 Using pantry and fridge staples make these vegan taquitos easy to prepare. You can even make them ahead of time and freeze them. In a large bowl mash the chickpeas with a potato masher or fork. Some larger pieces are ok, but you want the mixture to stick together. Add the chopped artichoke hearts, Butternut Mac sauce and buffalo style hot sauce and mix to combine. Scoop about 2 tbsp of the filling onto each tortilla and roll tightly. Place seam side down on a baking sheet. ~1/4 cup hot sauce makes a nice mild heat, if you like things spicier feel free to add more. ~The Butternut Mac sauce can be made ahead of time and stored in the fridge. 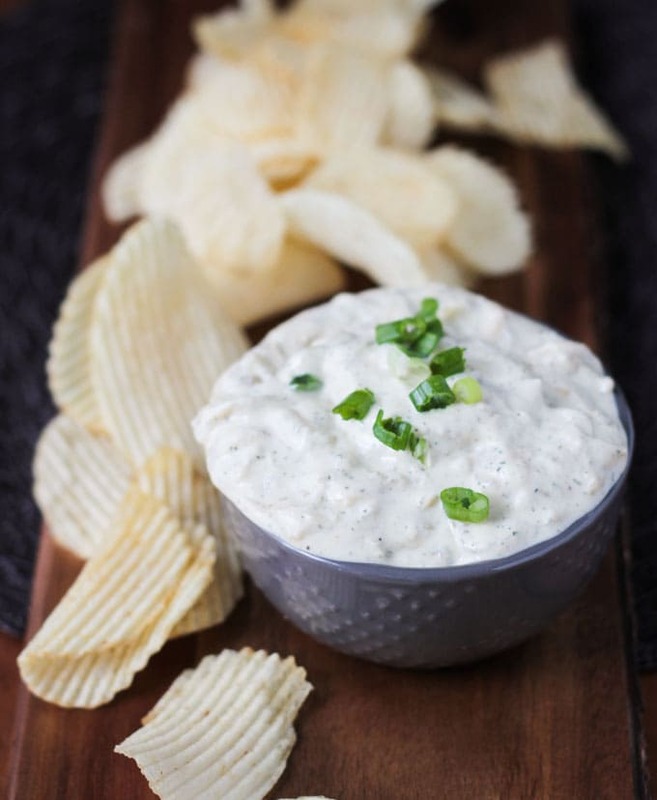 ~The Creamy Cumin Ranch, if using, can be made ahead of time and stored in the fridge. ~The taquitos can be assembled and then frozen until ready to heat and serve. They may take a little longer to heat through. ~Nutrition info calculated using flour tortillas and does not include dipping sauce. I have just made these and let me tell you… I am sold. I used a different mac sauce as cashews aren’t something we can just buy here without going in the red but I made sure to find one super close to it. The taquitos themselves are PHENOMENAL. If you’re like me and accidentally blended the chickpeas a little too far (hummus anyone? ), I would recommend adding a tad bit more artichoke. Also, nutmeg surprisingly brings out the flavour of paprika if you love the smokiness like I do. One question I do have is what to do with the extras? I made so much because I was so excited and have about 1.5 cups left of the mix with no idea how to use it besides blend it again and make a dip. Any suggestions? Oh yay, so glad you loved them! I’ve had several readers make the sauce using white beans with success…fyi…but glad you found one that worked for you. As for leftovers, I might spread it on toast for breakfast or sandwich it between two slices of bread for lunch. Maybe make a buddha bowl…add some rice and greens and mix it all together. Or scoop it up with crackers for a snack! Let me know what you do! Soooooooo this is pretty good. The ranch puts it over the top for sure. I added 1/2 of a jalapeño to my ranch and it’s amazing I love it! I wish I had some avocados to make guacamole because that would also be amazing and also some vegan cashew queso would be really good. I was skeptical about the butternut Mac sauce but was very pleasantly surprised because it was delicious as ever. Absolutely love these! My husband and I are slowly adding more plant based meals into our diet and these were amazing! I saw that you mentioned these could be frozen and then cooked, with our busy weeknight schedules, we were wondering how long these could last in the freezer? Also, how would you recommend storing them in the freezer? Airtight container? Freezer paper and freezer bag? Also the butternut “cheese” sauce was great with adding a bit of salsa and corn chips! Hi, Elizabeth. So happy to hear you love them. I would suggest placing them on a parchment lined cookie sheet or large plate and freezing them. Once frozen, you could transfer them to a plastic freezer bag. That way they won’t stick together. They should keep for a month or two. And making queso with the butternut mac sauce is a great idea! Made these for my husband and I. My husband, who is the definition of a meat-lover, absolutely loved these. He didn’t catch the lack of chicken until I told him. They are absolutely delicious, and our boys loved them too. A new staple in our home. That is so awesome!! Thank you, Maria! So happy to hear you all loved them! Made these for my omni friends and everyone enjoyed them. Used the 1/4c of hot sauce and it was just right! Yay!That’s so awesome to hear. Thank you, Kim! These are absolutely incredible! This will definitely be a staple in my house. Thank you so much! Thank you so much Tiffan! I just saw your IG post too! Thank you so much for sharing your feedback! !